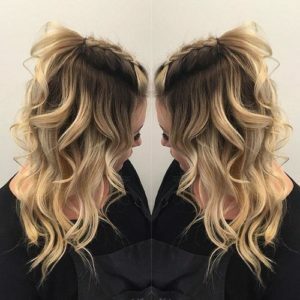 We’re seeing this style all over celebrities and social media right now, and luckily it’s one of the easiest to create. 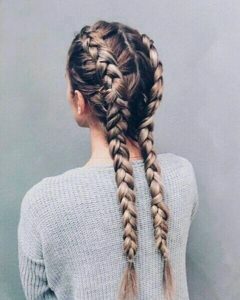 Just part your hair down the middle and create a tight dutch braid in each section, aiming to position the braid a little closer to your ear than the middle of your head. Even on days when looking trendy isn’t your first priority, this is a super practical style for keeping your hair up when you’re sweating it out at the gym or running errands all day. 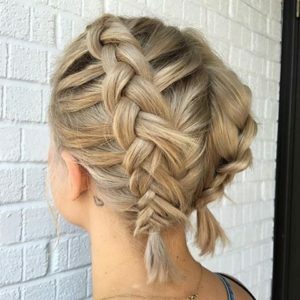 We see this classic single braid more often with the french braid technique, but going dutch is a nice easy way to add some variety to the look, and won’t take you any longer to pull together. 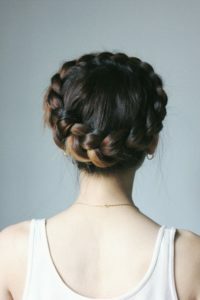 These twin Dutch braids are a little bit looser and more relaxed in how they’re put together, and the braids are slightly angled towards the nape of the neck, falling down the back instead of over the shoulders. As pictured, this is a great way to show off dimensional color in your hair, whether you’ve got a fresh salon balayage or just some natural sun-kissed highlights. 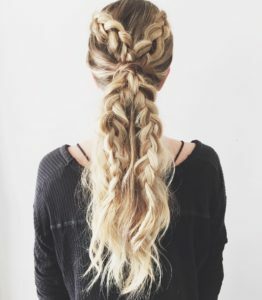 Braid a dutch braid on one side of the head, gently pulling apart when you’re finished to create a thicker effect as pictured. With the loose hair at the nape of your neck, twist together into a bun, then pin in place. Repeat this process on the other side of your head, and this dutch braided updo is all yours! 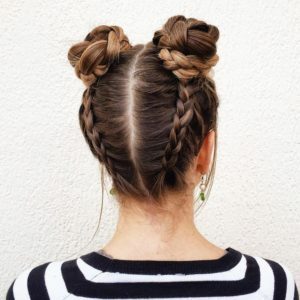 Start this style off by creating a dutch braid from the left and right sides of your head, angling each braid so that they meet at the back of the head. Secure the braids with small elastics, then tie all hair together in a ponytail where the two braids meet. Braid two three-strand braids into your ponytail, giving the illusion that the braids are passing through the ponytail, then use a loose piece of hair to wrap around the base of your pony and conceal all elastics. This style is created with two normal dutch braids that have been pulled apart for maximum separation without actually undoing the braid. If you’ve got shorter hair with layers, this style might be difficult for you, and we recommend using a product with grip so your hair doesn’t slip out when you’re gently pulling. If you’re new to braiding, these dutch braids at the back of the head might be a challenge. 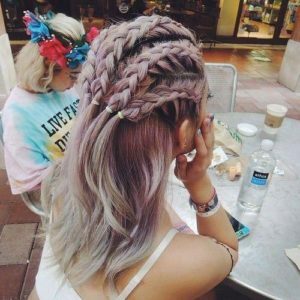 But if you think this style is too cute to pass up, grab your best braiding buddy and get to work! 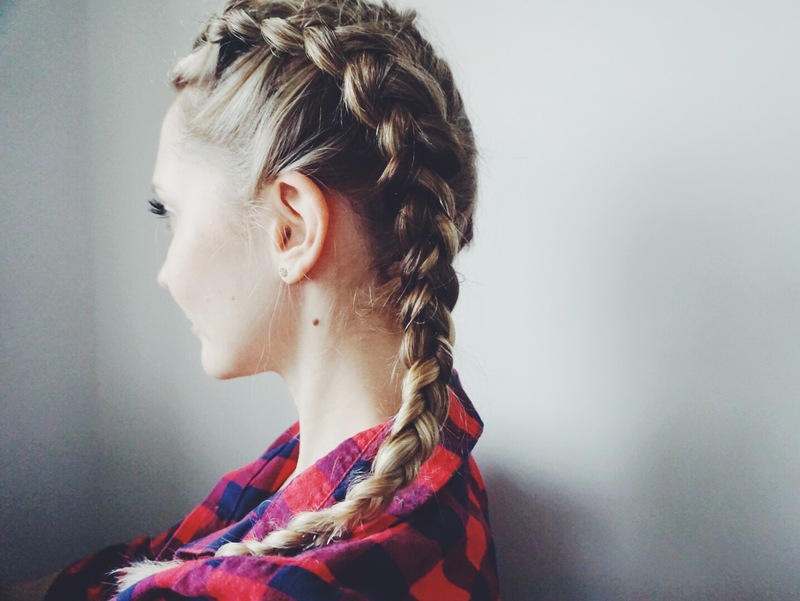 Dutch braid from the nape of the neck upwards, securing hair in two pigtails once complete. Braid each pigtail in a three-strand braid, then wrap each braid around itself to create a bun and secure with pins. 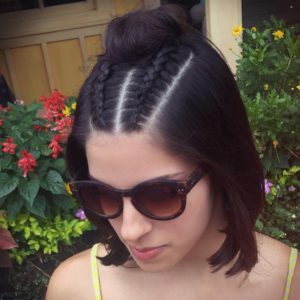 These skinny dutch braids are great for keeping hair out of your face, and are a nice option for women with shorter hair who can’t wear some of the thicker dutch braid styles. 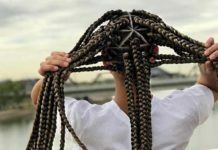 Instead of braiding hair all the way to the ends, these double dutch braids get tied off at the nape of the neck, giving you some flowing hair to play with. 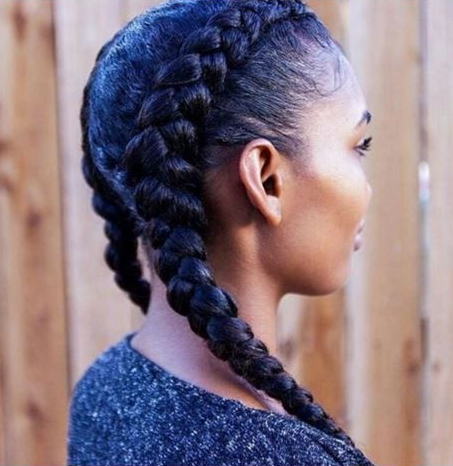 This is also a helpful option if you have trouble keeping your braids looking tight at the nape of the neck. 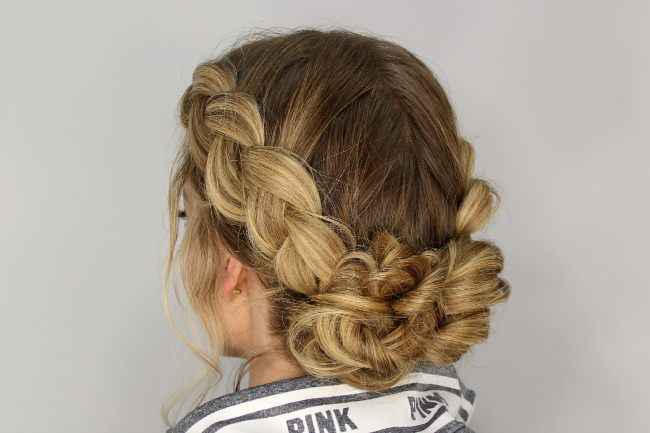 This braided updo is perfect for thick, mid-length hair. 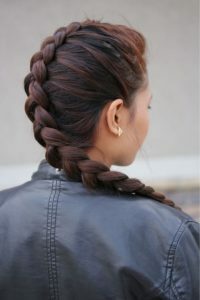 Create two dutch braids, and fan them out carefully to help them look thicker without being messily pulled apart. To finish off the style, pin hair together at the back of the head. 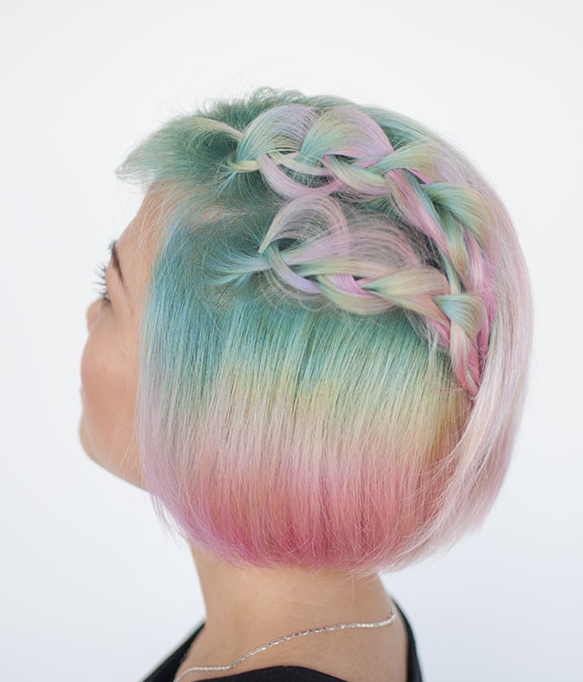 Going dutch doesn’t have to mean putting your hair in an updo. 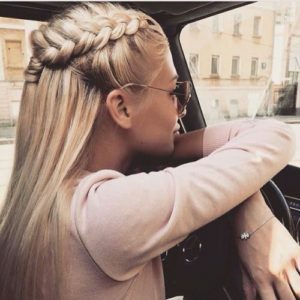 This style allows you to show off your long hair, and is one of the easiest braided styles to do on your own, since it doesn’t involved braiding at the back of the head. If you’ve got hair that’s very long and thick you can wear twin dutch braids in an extra loose, pulled apart style. It’s not as practical for playing sports or hitting the gym, but makes for amazing, photo-worthy hair. 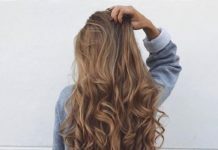 One easy dutch braid on the top section of your hair takes this bouncy, curled style to the next level, and this style is a good way for beginners to practice their braiding technique. 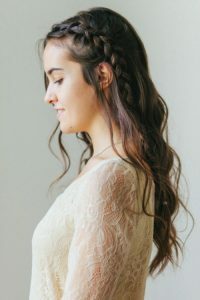 Proving that twin dutch braids can even be dressed up for a bridal hairstyle, this look adds the extra touch of wrapping braids at the nape of the neck. 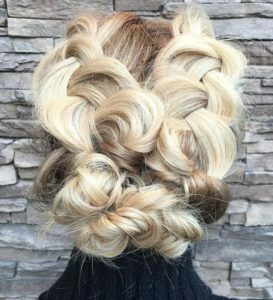 To copy this look, braid a dutch braid down each side of the head, leaving a piece of hair loose at the nape of the neck on each side. Once your braids are finished, wrap the loose piece around the braid and pin in place. Begin a braid at the front of your hair to one side of the part and continue using the dutch technique to create a braid that wraps around the back of the head and towards the front again. 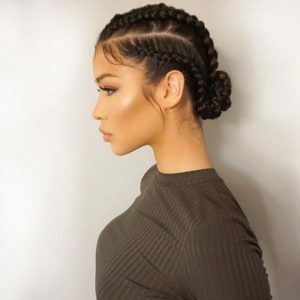 Once you’ve come back to where the braid began, continue braiding hair to the ends, and pin this loose braid to the head so it becomes part of the halo shape. Twin 2 dutch braids look just as cute in a half up style as they do braided all the way to the ends. 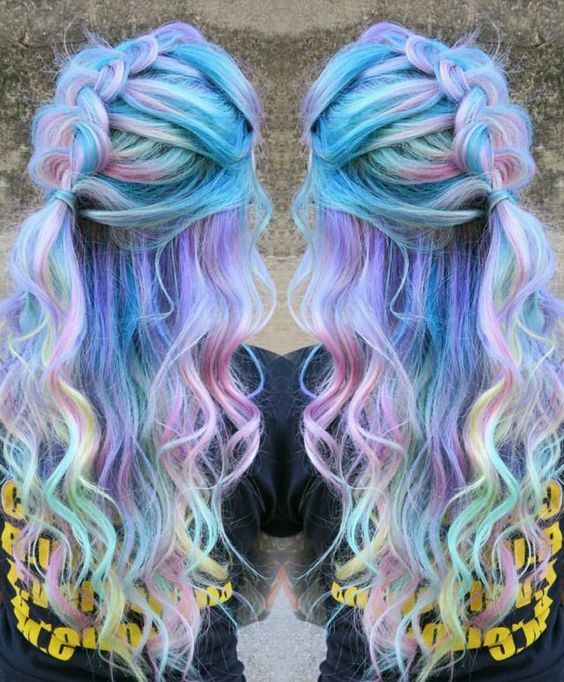 This style is great for if you’re in a rush or you feel like letting some of your hair flow freely. 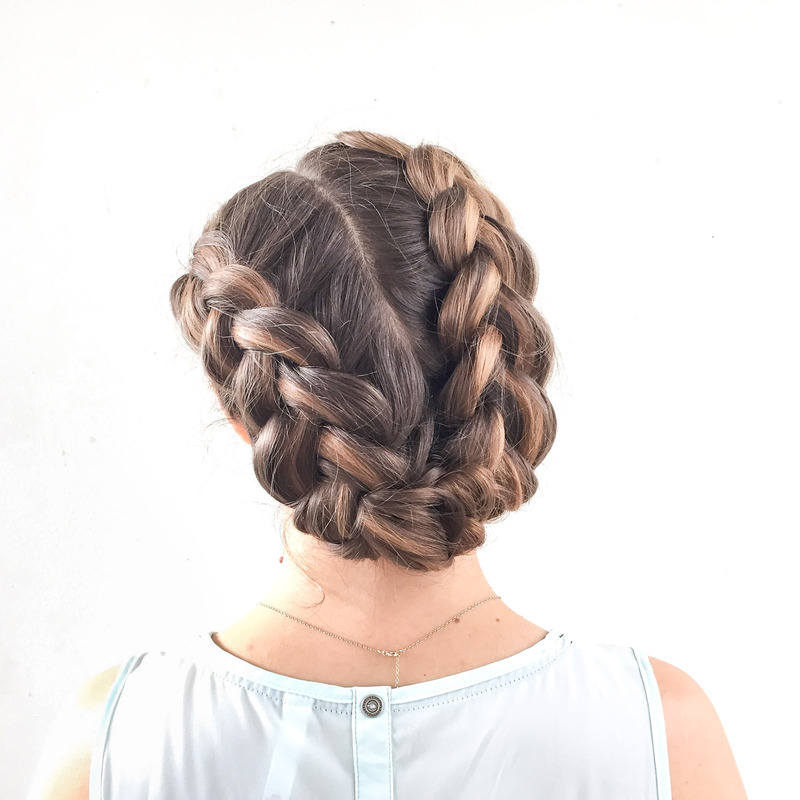 Don’t be afraid to try a dutch braided style just because your hair is on the shorter side. Product and pins can help keep shorter layers in place, or leave a few loose pieces for a style that’s messy chic. When you combine a trendy dutch braided style with the pastel and mermaid hair crazes, you get a hair match made in heaven. The dutch braid on top shows off hair’s inner and outer layers at the same time, while the loose curls on the bottom help bring the mermaid effect to life. 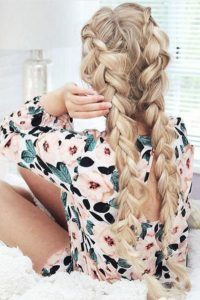 To get this dressed up ponytail, make a dutch braid on either side of the head, then tie all hair in a ponytail when you reach the back of the head. 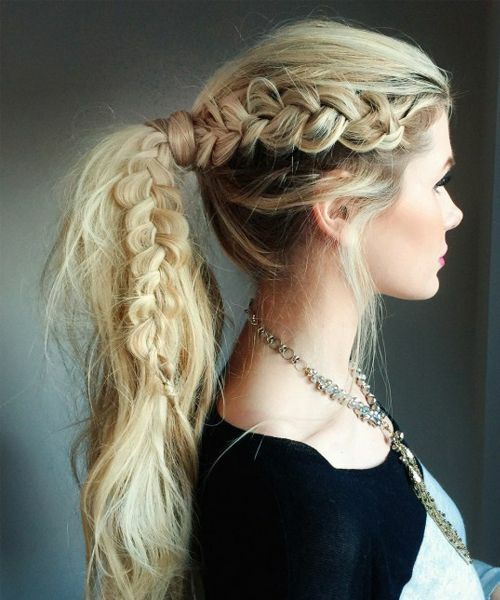 Once your pony is secure, continue braiding in the loose ponytail on the same side of the head as your dutch braid. 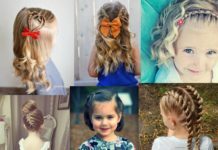 This style brings you all the fun of four dutch braids without having to take the time to braid all the way to your ends. 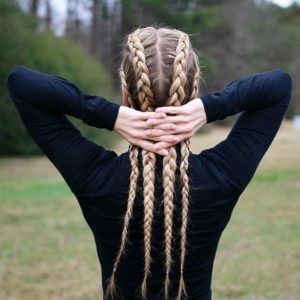 If you’re new at braiding your hair or your arms are getting tired, this is the style for you. Pulling apart braids, also known as pancaking, makes them look bigger and flatter. 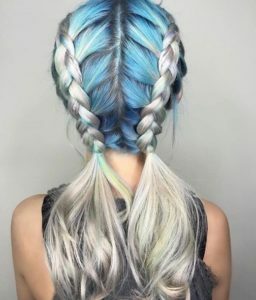 These 2 dutch braids are fanned out to ultimate effect, and they end up covering most of the top of the head. 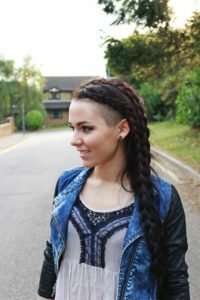 If you’re not confident in your braiding skills, this technique can actually help hide imperfections. A great protective style for anyone with natural curls, this hair is braided into four braids with long hair at the ends styled into a bun. Once you’ve mastered the dutch braiding style, it’s time to add other techniques into the mix. 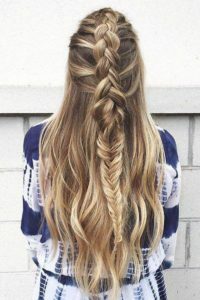 This look is half loose dutch braid and half fishtail braid, and leaves plenty of free flowing hair to balance out the style. These 2 dutch braids help show off an undercut, creating the perfect mixture of soft romance and edgy style.